Possibly the strangest, most trope-filled Web Animation to grace the interwebs. Kimi: So, you're risking your lives and the lives of everyone in your country to find a girl from a myth that might not even be true? Kimi: This is just crazy! Why should I even believe you? Hatobu: * blink blink* We have... wings? Angelicate Avenue is a furry fandom fantasy series by Alli Kat Nya! Meet Kimi Kohaku, a regular middle school girl desperate to have some excitement in her life. She takes it all back when 2 mysterious boys named Koja and Hatobu begin popping up everywhere, all the time! Even though they provide her with evidence that they are from a "Magical Kingdom", she still convinces herself they are just some weird boys obsessed with her! That is, until she learns that the fate of the entire universe is dependent on her! Soon, Kimi's love for the Angel-cats grow more than she could have thought possible and she must decide which is stronger - her duty of saving the world, or her feelings for the two boys.Angelicate Avenue is a furry-tale of romance, courage, and hilarity! So far there have been five episodes and one Spin-Off of the series. Since AlliKatNya says that this is intentionally parodying Japanese Media Tropes, expect to eventually see a lot of tropes on this page. Affectionate Parody: AlliKatNya states in her description of Episode 4 and in a response to a viewer comment that this is a parody of those uber-shouju animes. Art Shift: Between the second and third episodes, the style changed and improved dramatically. 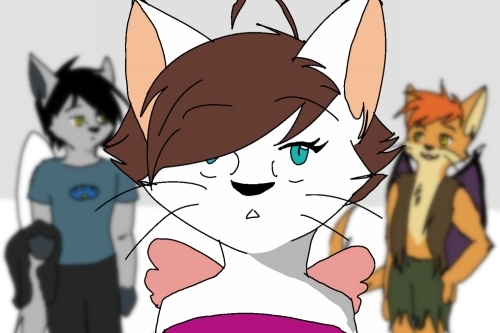 Author Avatar: Fans noted the resemblance of the Perky Goth in episode five to AlliKatNya's furrsona. Backstory: The entire monologue about the Angelicate World. Because Destiny Says So: Hatobu and Koja basically tell Kimi that she's destined to change everything. Blank White Eyes: What's going on here? * sees angelicates surrounded by fangirls* Beh?! And the guy who sits behind Kimi in the classroom scene. Cat Smile: Justified because they're ACTUALLY CATS. Deliberately Monochrome: Koja reminding Kimi about what happened after the masked being attacked her in the previous episode. Good Wings, Evil Wings: Sort of. Different breeds of Angelicate have different types of wings. Kimi and Koja have feathery wings, Hatobu has bat wings, and Kira has insectoid wings. I Just Want to Be Normal: Kimi, very much so. Inner Monologue: Kimi does this a few times. Jaw Drop: See Blank White Eyes. Luminescent Blush: All the time with Kimi. Also briefly in episode five, with Hatobu blushing after Kimi (apparently) told him off for calling her his girlfriend in front of a crowd of students from Kimi's high school. Magical Girl Warrior: Kimi, oh, Kimi. (in one breath) Hatobu: Hiya! I'm Hatobu Daakagama, first-rate angelicate and the best looking guy in all the land! My hobbies include collecting magical beads, ruling the world and writing poetry about my past loves. Maybe you'll make it in there someday. Anyways, my blood type is B, my favorite color is red and I love chili peppers! Mysterious Protector: Koja fits this to a tee in the early episodes. Ocular Gushers: Parodied by Hatobu. "Something like, 'Oh! I can't save the world!'" Ordinary High-School Student: Kimi, the protagonist, even uses these exact words to describe herself! Recycled INSPACE: Anime WITH CATS. Red Oni, Blue Oni: Koja being the blue-type personality, Hatobu being the red. Shout-Out: In episode five, Hatobu wears a shirt with the "BloodClan" logo on it, referencing to AlliKatNya's AMV about Scourge . In the same episode, Firestar is in Kimi's class, but AlliKatNya hints that there are other things shouting out to other media. Kimi's math teacher bears an uncanny resemblance to Mrs. Wormwood. There's a collection of Fruits Basket manga in Kimi's room. I think this is because it's most likely a photo of Alli's room, as her site reveals her to be a Fruits Basket fan. Stalker with a Crush: Averted; Koja "stalks" Kimi, but it's Kimi who has the crush on him. Sweat Drop: Frequently used, especially in the more recent episodes. Transformation Sequence: AlliKatNya intended there to be one , but based on Kimi's randomly-appearing outfit in episode five, fans are unsure if she scrapped the idea. Tsundere: Kira Tonbo (Introduced episode 6) is a textbook Type A. Wake Up, Go to School, Save the World: In early episodes, Kimi experinces sadistic teachers and nosy classmates, even after discovering she is the "chosen one". Winged Humanoid: Angelicates. More like Winged Felinoid, but whatever. You Gotta Have Blue Hair: Well, fur, but still.